Following on from the review I did for the DE1995 a few months ago I got a bottle of the '97 because I liked it so much. Batch 4/502. I wish I had the 95 to do a side by side. Mind you, I also wish I had a swimming pool full of this stuff. I did the tasting notes for this, then looked at my old notes and they are virtually the same. Nose: Dusty, dry spices, smoky, peaty. Sea salt with overlays dark fruits. Silky mouth feel, slight fruity spice, big smoke, salty, sweet, cherries, sherry. The finish is fairly long, sweet and smoky. Not as long or big as the 16 but still epic. @CanadinNinja I think it's hard to tell without being able to taste along side. I would say the 95 and 97 are both very similar it quality. Either way it's a lovely drop. Not as pokey as the regular Lagavulin but more finesse. @tjb, how does the '97 compare? I've always enjoyed the classic 16 year old Lagavulin but I splurged for Thanksgiving and bought a bottle of 1994 Distillers Edition. Well, It didn't disappoint... I found it much smoother than 16.. I was able to break down the nose and the subtleties of the first taste fairly easily. There are notes of dark cocoa, Brown Sugar or Molasses,sweet vanilla and a nice wisp of peat smoke.. the finish is extremely smooth and satisfying... A fine dram that can be savored... I drank mine neat... Sometimes I use whisky rocks to chill it a bit but this single malt of malts doesn't need it... Enjoy!!! I just watched the Olympic Games as I do regularly these days. Table tennis is always fun to watch and Germany got a bronze medal, which is really great and made me happy. Turning the TV off there comes a nice warm thunderstorm from a distance. I really love this mood so I am searching my shelf for a fitting dram. Has to be something powerful, definitely some peaty whisky. So my choice is on the Lagavulin DE 1994-2010. It comes with a deep amber color and the thick fluid runs down the glass in wide slow paths. On the nose it's really sweet and smoky. There you get the sherry, which comes from the Pedro Ximenez casks. The nice sweetness reminds me of candied apples and caramel. The smell is really nice but not overwhelming. It is smoth. Maybe a little more punch would have made this even better, but I guess this is due to the relative low ABV with 43%. Nonetheless this is a great nose. On the palate there is lots of smoke and peat. There are earthy muddy tones and there is leather. Also some fruity flavors, like dark berries. The finish is sweet with spicy oak. It is really nicely warming the body and lingers very long. Wonderful. When I finish my dram of this DE, the warm thunderstorm is over and the sun is shining again. Not so different from this nice whisky: warming and intense, but also lets your thoughts run free. 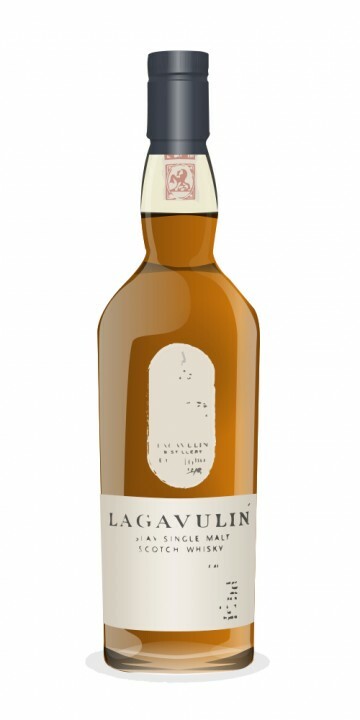 Having always heard about the richness and luxury of Lagavulin, I vowed to buy a bottle one day. I never dreamed that day would be today! I have been trying to keep within a budget of $60.00 and less, and recently tasted a lot of wonderful Irish Whiskies. Today, I saw a "New Item" at the liquor store. They were out of the Lagavulin 12 year and 16 year, but had this item which really intrigued me. Only a few dollars more than the regular 16 year, so I thought why not! After I raced home, and opened the bottle, I was greeted with an amazing balance of peat, smoke and sweet sherry. An incredible exercise in balance, I have to say! The taste in nothing like I have tasted before. If I could have taken a peaty, smokey single malt and combined it with a rich, sweet sherry one, this is better than I would imagine it could be. Even with the sherry, this is a dry whisky all the way through. A very dry finish, with the smoke and peat mostly lingering, rather than any sherry. There is not even any of the sweetness that I associate with the Laphroaig Quarter Cask, which is one of my favourites. Another thing that I really like about this, as opposed to some 16-18 year old single malt, is that it's not too smooth. It still has a bit of roughness to it, which keeps it interesting. It also has a lovely warmth to it, on the way down. Not a burn, just a wonderful warmth. I love the dryness at the end, which actually seems to clean my palate - without a hint of bitterness - for the next sip! Carl - Thanks for your great review - based on my growing knowledge, everything you said actually made sense. I have the Lag16 - and enjoy it greatly - it is a balanced scotch - but I tend to prefer the slightly less dry and less smokey scotchs - and get enough of the smokey from the Laph and Ardbeg that are already in the closet and not necessarily eager to be repeated. So while I wouldn't mind a dram - I will pass on a bottle - for which info I appreciate you giving me!!! Sometimes the best decisions are the don't buy decisions.